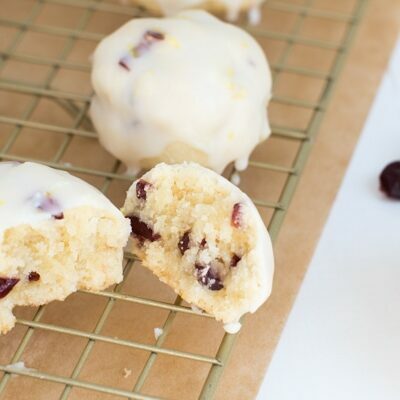 They’re a very simple cookie with a short list of ingredients: butter, flour, sugar, currant jelly and powdered sugar. Everything but the powdered sugar and jelly is mixed together and kneaded together until it comes together in a nice, solid dough ball. 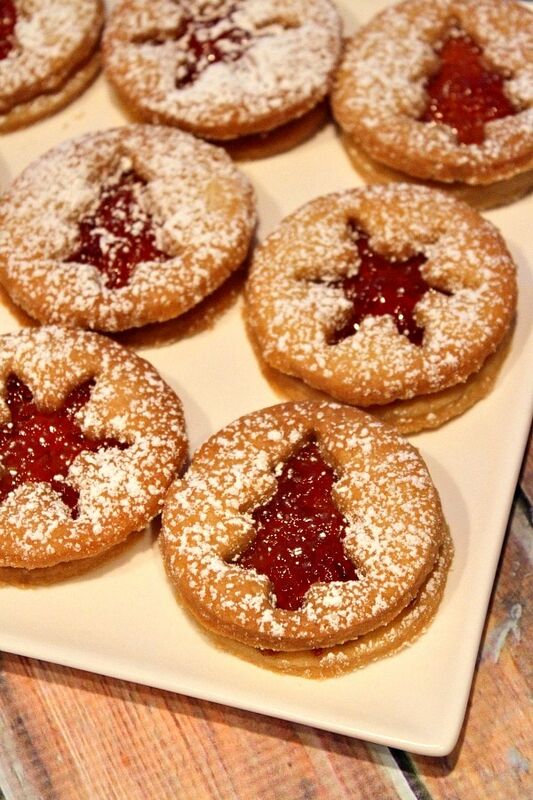 Red currant jelly is spread onto the bottom layer of the cookie, then it’s topped with the 2nd layer and dusted w/ powdered sugar. After a while, the powdered sugar that has landed on the jelly soaks in a bit so the decorative jelly cut-out part is more prominent. And that’s it- one of my favorite childhood Christmas cookies. Mom wasn’t a recipe developer, so she definitely got this recipe from somewhere. Maybe you’ve seen it before. In any case, all of these years later… I still love them! One of the cookies my Mom made for Christmas as I was growing up. 1. 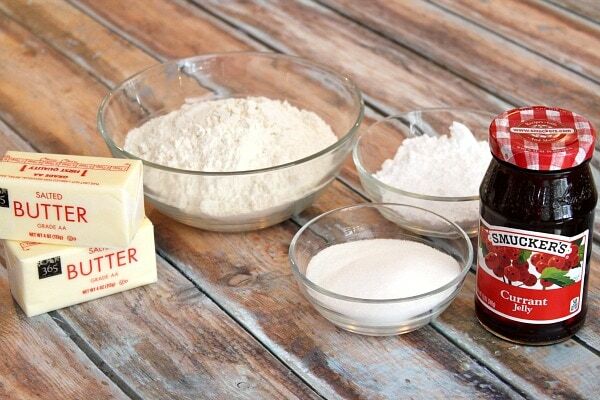 Use and electric mixer to combine the butter with the sugar until fluffy. Stir in the flour, a little at a time, blending well to make a stiff dough. The mixture will be very crumbly for a few minutes until you finally see it coming together in clumps. Remove it to a lightly floured surface and knead the dough together until it comes together nicely in a ball. Wrap in waxed paper and chill until the dough is quite firm. 3. 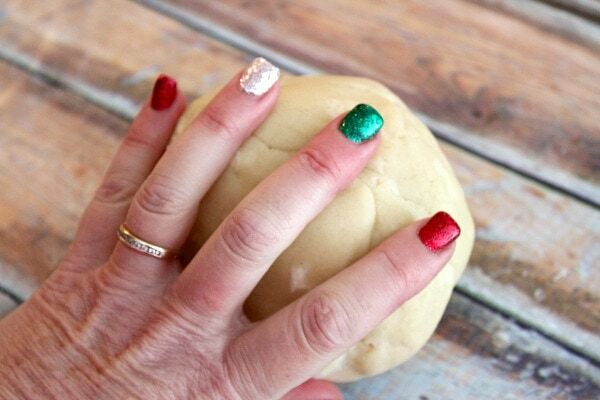 Roll out half of the chilled dough 1/4-inch thick on a lightly floured cloth or mat. 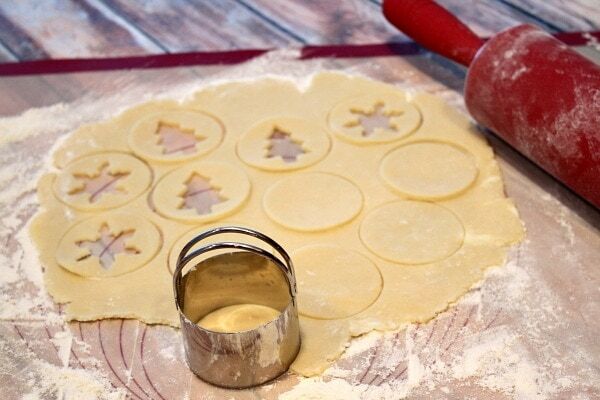 Cut out 24 rounds with a 2-inch cutter; cut a small round from the center of half of the cookies. 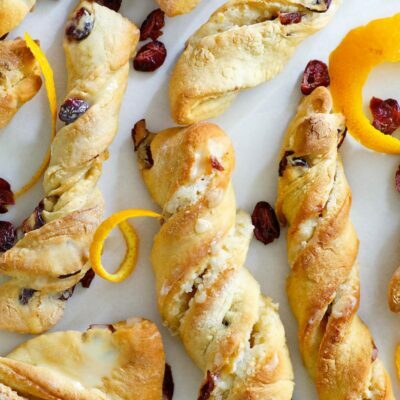 DO NOT roll the dough too thin or the cookies will be too thin and crispy for working with. Thicker is better. Repeat with the 2nd half of the dough. 4. Place large and small cutouts 1/2-inch apart on a cookie sheet. Re-roll trimmings and cut out. 5. Bake about 18 minutes, or until firm and lightly golden. Remove from cookie sheets and cool completely. 6. 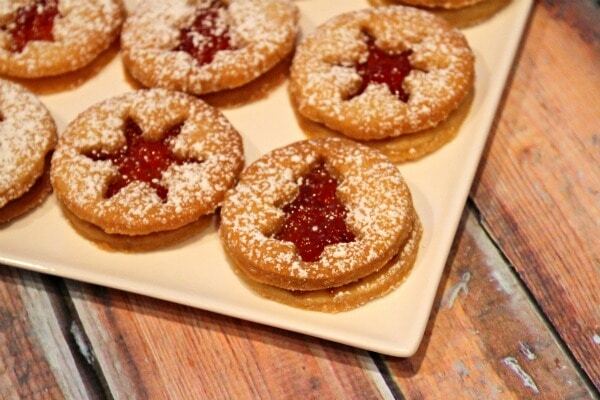 Spread jelly on each large round; top with cookie ring; sprinkle lightly with powdered sugar. *If you're not able to locate red currant jelly, you can sub raspberry or strawberry jam. But the red currant jelly is REALLY GOOD, so I recommend looking for it. These cookies look delicious! I love the jelly in the center! Your nail polish made me SO happy. As did these cookies. 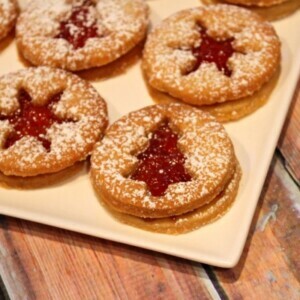 Almost like linzers but cute! Very pretty cookies- love the sparkly nails, too! 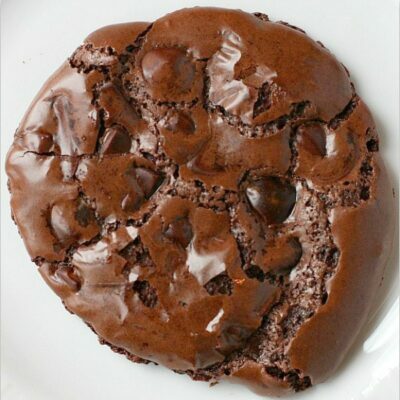 A perfect cookie for the holiday season. I love family recipes! These cookies couldn’t be more adorable! Love the name too! PS: Your nails are so festive!! Love these! 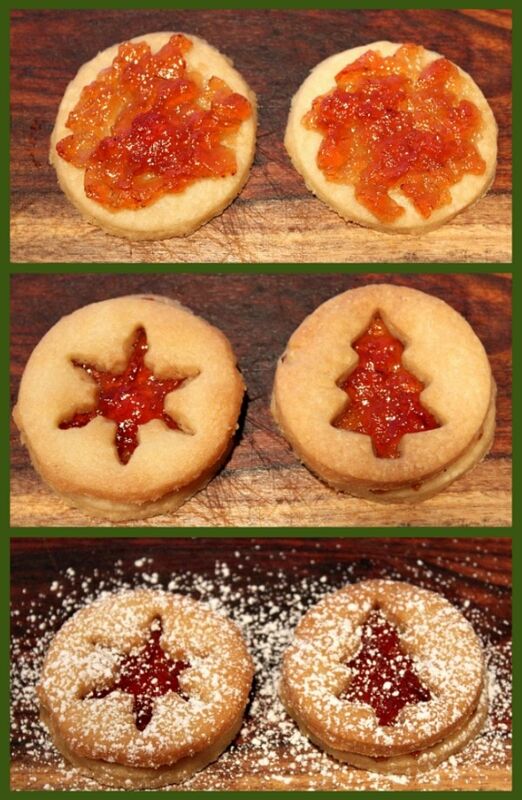 My mom always makes a similar style cookie to showcase her homemade jellies. lol, yes I will change this!!! Thank you! These cookies are so cute and festive. I am loving them, but oh my goodness!! Your nails! So festive! Love those too! Totally unrelated- But I am all over your Christmas nails! 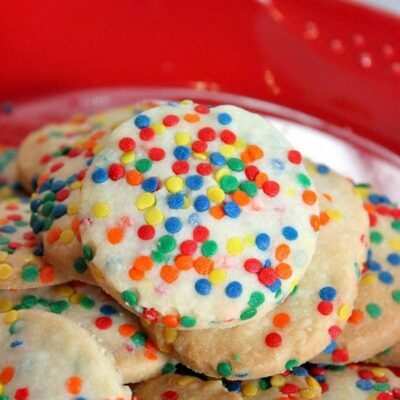 My grandma used to always make these at Christmas and they were one of my favs…yet, I totally forgot about them. Thank you for reminding me! These are so pretty! Girl, your nails are too cute!! And the cookies, too. Love that jelly in the middle! !